KICK-START is a live music club in Malmö, Sweden, that showcases the best up and coming local bands. The club has enabled many strong acts to take the stage throughout the years, including The Ark, Sahara Hotnights, MF/MB, Tingsek, and many more. This spring, KICK-START will be engaging fans to take part in booking some of the best, new, local bands around, through Emues. In other words, KICK-START is inviting YOU to be a part of ensuring bands get to play live at Babel, Malmö, for an audience that loves them. 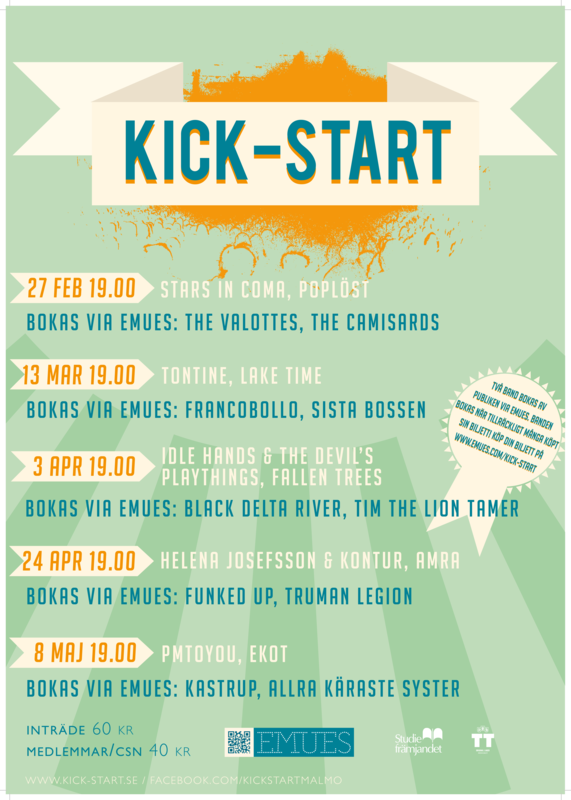 The KICK-START season premier is this Thursday, February 27th, at Babel, with Stars in Coma, Poplöst, The Camisards and The Valottes. The latter two bands have been successfully booked by the people through Emues! Don’t miss out, and get your tickets here. Below is the whole season’s line up. Be a part of booking KICK-START’s concerts on Emues!